We often memorize what we would like to remember and forget unwanted memory. In real life, actually, of what should not have been reminded was stuck while what should have been memorized was forgotten. This might be the most appropriate description for this photo exhibition “[un] forgotten” by Lek Kiatsirikajorn and Stephanie Borcard / Nicolas Metraux who aimed to present aspects about memory which does not belong to them, but communally associates with our surroundings. This exhibition is based on the belief in (painful) social experiences, which express some facts. The photographers are from different parts of the world—one is the Thai who studied abroad and the other is a couple of foreigners residing in Thailand. In 2011 Thailand faced the natural disaster, along with political issues. Flood devastated many provinces including Bangkok, the capital. Civilization without direction brought by capitalism led Bangkok to peculiar growth and expansion. When the flood, punishment by nature, came, tragedy became the conclusion. Lek Kiatsirikajorn kept all the devastation in form of photographs. The real conditions of an agitating capital became the substance, which could survive for 30%. In other words, the rest proportion was unable to survive due to the flood. Despite the fact that they are just photographs, they truly portray sorrow caused by political corruption and benefits. The breath of the survivor could be heard from the photos. Hope and wish might be the only factors during such torturing period. Flood finally became the painful past; however, stain still last in the memory. Stephanie Borcard / Nicolas Metraux are the Swiss couple who are residing in Thailand. They have interests in a nursing home for patients with Alzeimer in Chiangmai, found by a Swiss guy whose family member also suffered from this disease. All residents are foreign elderly who face problems of memory loss at different levels. These patients all were led here by the members of their family into the warm hands of local staff, who took very good care of them as if they were relatives. Grief and mercy were paradoxically portrayed through the eyes of the photographers. These daily acts are recorded, just like a simple diary. What have been recorded; on the contrary, have become a complete past for these patients, whose memories are now fading away. As the time goes by, wrinkles on their faces seem to replace their past, present, and also memory, day by day. Hence, this exhibition reflects the opposition between “the wish to forget but remember” and “the wish to remember but forget”. These photos are to reflect the facts of what is happening in big cities, which has not only awoken the new memory but also created a method to forget it. Lek Kiatsirikajorn studied painting at Silpakorn University in Bangkok before switching to photography, which interested him with its potential for outreach. In 2001 he decided to move to England and study photography at The Arts Institute at Bournemouth. He returned to Thailand in 2008 after spending almost seven years studying and working as a fashion photography assistant in the UK. During his last two years in England, Lek became fascinated with great American documentary photographers. The way they managed to project a strong visual documentation of American society through a personal vision inspired him to look back to his own roots. As an expatriate, he came to think he could understand his home country better than when he lived there. He became aware of aspects of it which he has not seen before, and this enables him to portray it in a more universal way through images of daily life. This new period of his life has been inspiring him to produce photography projects which are directly related to his own society. Lek is now based in Bangkok. He has been exhibiting internationally. In September 2013, He was one of the 20 photographers selected for a photography project called ”The Russian Moment”. The project was in the conjuction with the G20 Summit in St. Petersburg. Lek’s work ”Restoration from Within” was exhibited at The State Russian Museum, together with works from different renowned photographers. He was also selected by the Quai Branly Museum in Paris for the 2012 photography grant. 13 of 22 images from the series, ”Lost in Paradise” which he produced with the grant were included to the museum’s permanent photography collection. Stephanie Borcard and Nicolas Metraux are two Swiss photographers based in Bangkok, Thailand. They work on personal projects, influenced by their travels and by different forms of expression such as literature, art and cinema. They are interested in exploring the margins of social issues. Their recent series focus on the relation between individual and society, helping them not only to have a better understanding of the world we are living in, but also to question who they are. Curiosity and passion for others led them to different countries around Asia and most recently to Bosnia-and-Herzegovina. A book published by BENTELI Publishers, Switzerland, will finalize their long-term project in the Balkans and will be released in 2015. Visit their homepage to view their previous works. 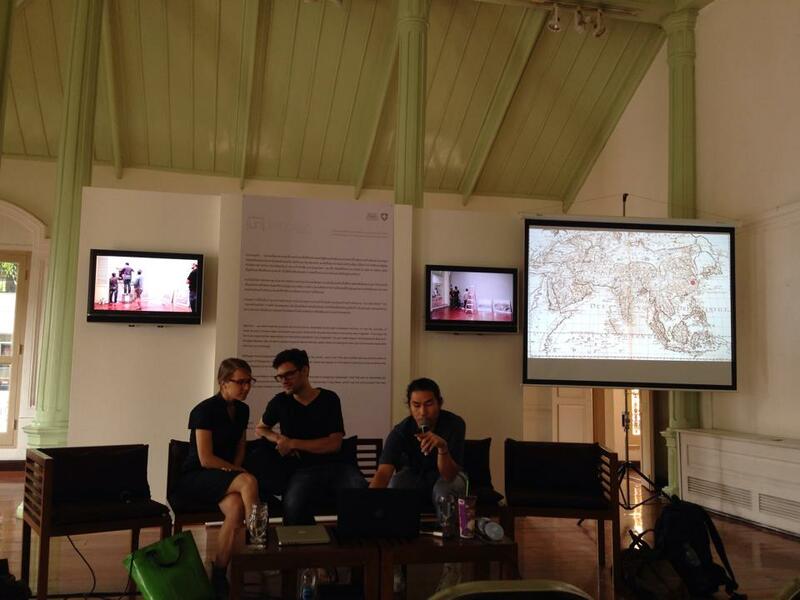 Lek Kiatsirikajorn and Stephanie Borcard/Nicolas Metraux, artists from [un]forgotten photography exhibition talked about their creativity in photography work in our activity, Behind the Photos : Artist's Talk, as part of the exhibition. The talk will be on Thursday 12 February 2015 at 2pm, Main Hall of the Art Centre Silpakorn University (Wang Thapra).